Cracking the Tech Career is the job seeker's guide to landing a coveted position at one of the top tech firms. A follow-up to The Google Resume, this audiobook provides new information on what these companies want and how to show them you have what it takes to succeed in the role. Early planners will learn what to study, and established professionals will discover how to make their skillsets and experiences set them apart from the crowd. 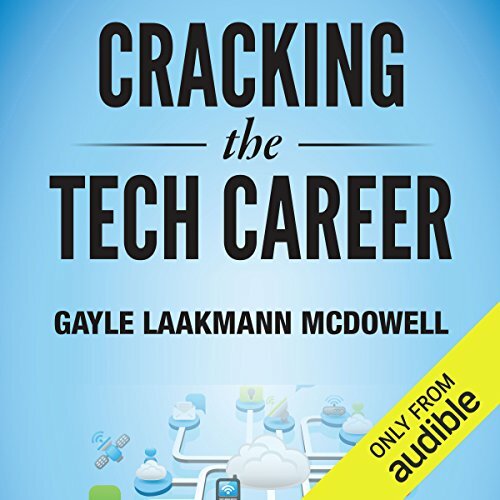 Author Gayle Laakmann McDowell worked in engineering at Google and interviewed more than 120 candidates as a member of the hiring committee - in this book, she shares her perspectives on what works and what doesn't, what makes you desirable, and what gets your resume saved or deleted. Apple, Microsoft, and Google are the coveted companies in the current job market. They field hundreds of resumes every day and have their pick of the cream of the crop when it comes to selecting new hires. If you think the right alma mater is all it takes, you need to update your thinking. Top companies, especially in the tech sector, are looking for more. This book is the complete guide to becoming the candidate they just cannot turn away. Discover the career paths that run through the top tech firms. Learn how to craft the prefect resume and prepare for the interview. Find ways to make yourself stand out from the hordes of other applicants. Understand what the top companies are looking for and how to demonstrate that you're it. These companies need certain skillsets, but they also want a great culture fit. Grades aren't everything, experience matters, and a certain type of applicant tends to succeed. Cracking the Tech Career reveals what the hiring committee wants and shows you how to get it. ©2014 Gayle Laakmann McDowell (P)2015 Audible Inc. Wish I had read this as a freshman! Good read for scoping out your entire career! The book covers a wide range of paths and how to walk them,including various strategies and tactics. Definitely recommend it to anyone interested in tech industry!! The content is almost directly from the google resume. Very bad narration. Buy the other book or just buy something else. Gayle focuses much more on the soft-skills side of the interview, and on what should and should not be on a resume, than she does in Cracking the Coding Interview [CtCi]. Consider the first few pages of CtCi only with more content and more topics. That's what this book is all about. awesome, very interesting and useful, even everything this book is well known to me but still it's interesting. The author refers to everyone in the tech industry as "she". Are men not be welcome in the tech industry? Is she delusional? I don't know. She shouldn't be taken seriously.